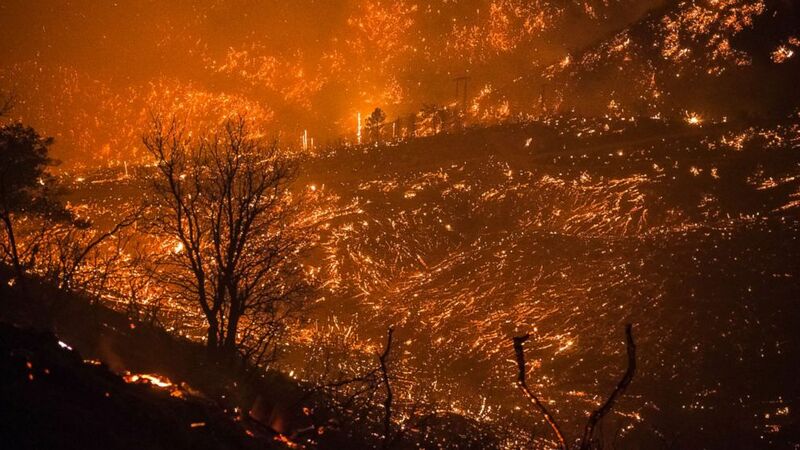 The destructive Thomas fire continues to rage in California. 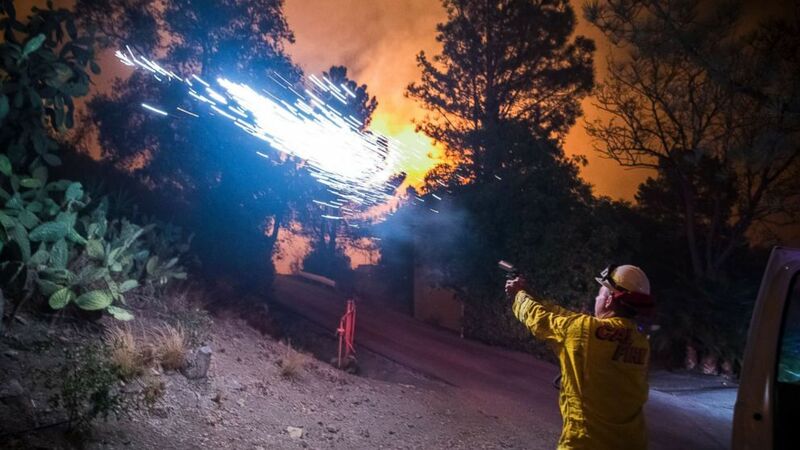 As massive wildfires continue to scorch Southern California, fanned by the whipping Santa Ana winds, thousands of firefighters brace for more extreme fire conditions in the week ahead. (Stuart Palley for ABC News) The foothills of the Santa Ynez mountains glow shortly after the fire front of the Thomas Fire passed through Monday night on Dec. 11, 2017, in Montecito, Calif.
Five fires have raged across California in the past two weeks, charring more than a quarter of a million acres, with 9,000 firefighters combating the flames, according to the California Department of Forestry and Fire Protection, or Cal Fire. (Stuart Palley for ABC News) Firefighters Jesse Prins, Clinton Frazell, and Jesse Cole from a Cal Fire strike team dispatched from Lake County, Calif., take a moment to observe the last air tanker drops of the day during sunset on Dec. 11, 2017. 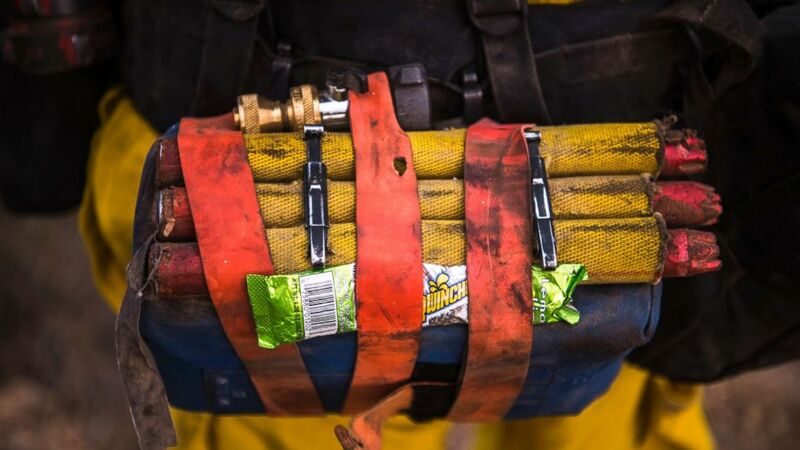 (Stuart Palley for ABC News) A Cal Fire wildland firefighter carries a fire shelter, fusees, hose nozzle, and powdered sports drink mix in their web gear. The Thomas Fire burns in Toro Canyon in the hills above Montecito, Calif. on Dec. 11, 2017. 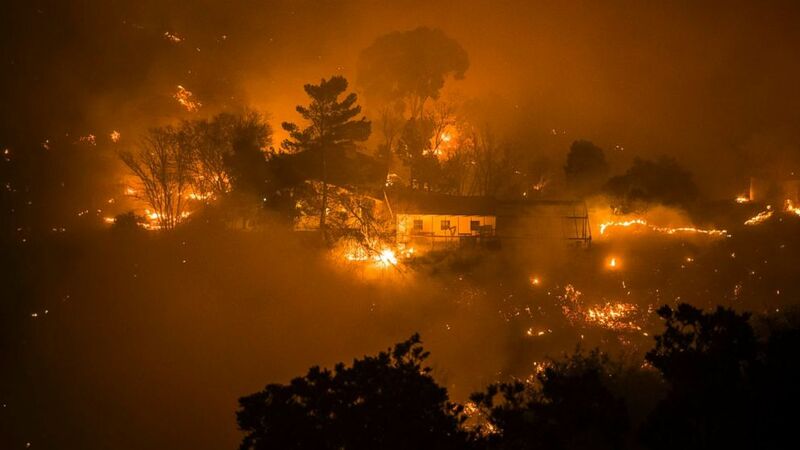 By nightfall the fire had burned 230,000 acres and was 15% contained, destroying nearly 800 homes. The Thomas fire in Santa Barbara and Ventura counties is by far the largest blaze, burning 237,500 acres and becoming the fifth-largest fire in California’s history. Since the inferno erupted in Santa Paula on Dec. 4, it has destroyed 921 structures, most of which were single-family homes. 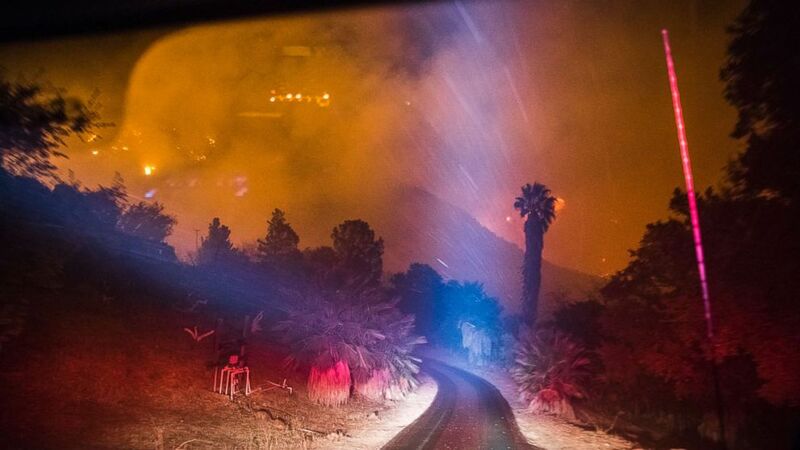 By Dec. 10, the Thomas fire had been only 10 percent contained, forcing the Santa Barbara County Sheriff’s Office to issue evacuation orders for the area from Buena Vista Drive to Toro Canyon and evacuation warnings for parts of Montecito, Carpinteria and Summerland. 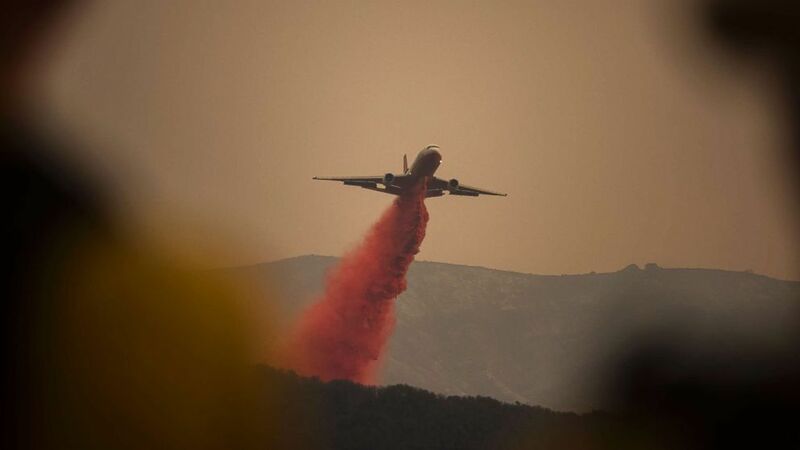 (Stuart Palley for ABC News) A DC-10 jet, or VLAT (Very Larger Air Tanker) drops fire retardant in Toro Canyon, Calif. on Monday afternoon, Dec. 11, 2017, before anticipated winds caused the fire to burn downhill. (Stuart Palley for ABC News) Cal Fire battalion chief and strike team leader Gino DeGraffenreid drives past a flaming hillside while checking on homes Monday night in Toro Canyon, Calif. at the Thomas Fire on Dec. 11, 2017. 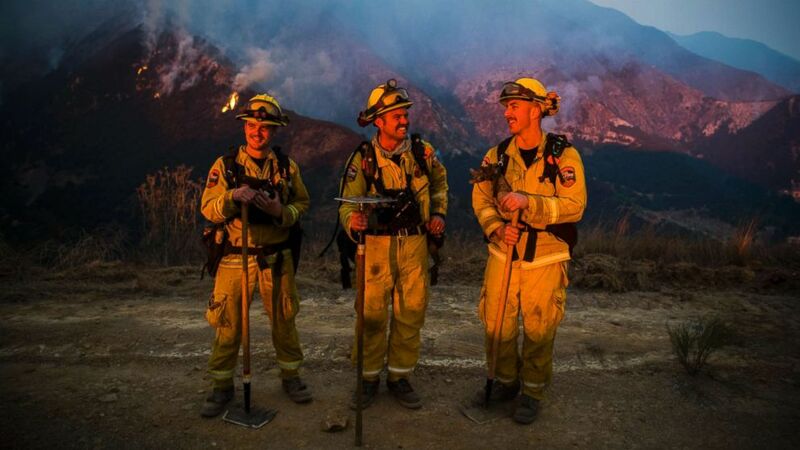 On Monday evening, Dec. 11, a team of wildland firefighters in the foothills of the Santa Ynez Mountains in Montecito, California, battled the Thomas fire as it bore down on Toro Canyon. The vegetation and brush on the mountain peaks hadn’t burned since 1964, and with extra-dry conditions, record hot temperatures and single-digit humidity, the result was a tinderbox as the fire pushed down into the canyon. (Stuart Palley for ABC News) A home surrounded by fire in Toro Canyon, Calif. on Dec. 11, 2017. Firefighters saved the home with minutes to spare but some outbuildings and a vehicle were burned. 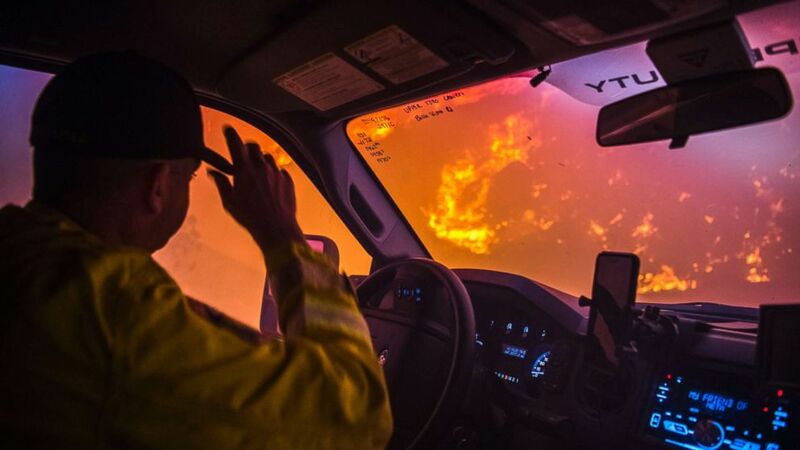 Photographer Stuart Palley was embedded with Strike Team 9140C from Cal Fire’s Sonoma Lake Napa unit, based in Northern California. The firefighter’s strike team of five wildland fire engines was stationed right in the center of the action in Toro Canyon. 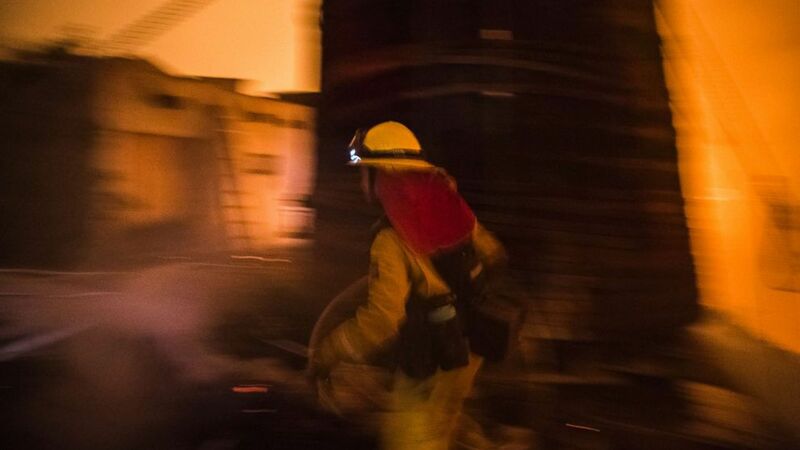 The strike team leader said his crews were “returning the favor” for all the firefighters from Southern California who went to help the unit when it battled the deadly Tubbs fire in Santa Rosa in October. (Stuart Palley for ABC News) A Cal Fire firefighter races to protect a structure in upper Toro Canyon, Calif. on Dec. 11, 2017. The home was saved but the water tank burned down the next morning due to a constant flow of embers. (Stuart Palley for ABC News) Cal Fire battalion chief and strike team leader Gino DeGraffenreid fires off flares to start a backburn to protect homes on Dec. 11, 2017 in Toro Canyon, Calif., at the Thomas Fire. Although the fire seemingly died down during the day, it was a raging blaze by sunset because of the wind, and to ensure firefighter safety, crews were forced to retreat downhill as the fire front hit. Meanwhile, in attempts to fight the blaze, strike teams shot off incendiary rounds from a flare gun to put defensive fire on the ground and allow fire crews to move downhill out of harm’s way. However, strong winds drove the main body of the fire downhill with unprecedented speed, starting spot fires all around the crew and Palley. (Stuart Palley for ABC News) An outbuilding burns in Toro Canyon, Calif. on Dec. 11, 2017. After the main danger of the fire front passed, the type 3 brush engines powered up steep hills and narrow residential roads to jump back into the fire and continue protecting homes. Fire crews worked until 8 a.m. the next day, and after a 30-hour fight, all but one of the hundreds of homes in the area were saved. 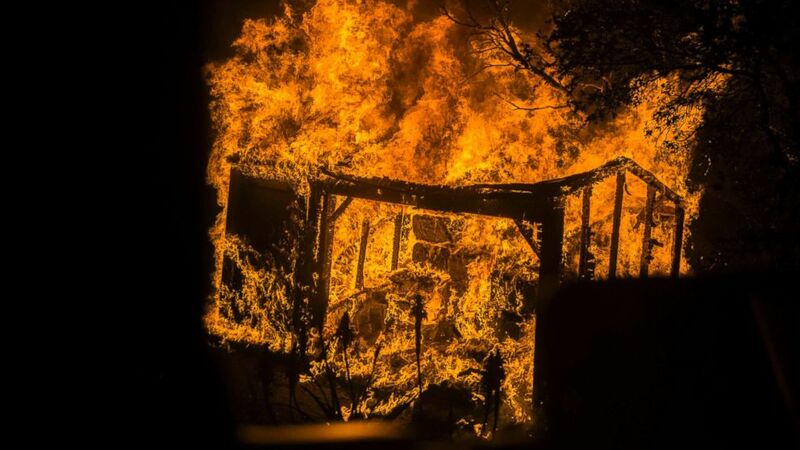 A few outbuildings and vehicles scattered in the brush were lost, but given the extreme fire conditions, the quick work of Cal Fire crews and other departments made a miraculous save. (Stuart Palley for ABC News) Upper Toro Canyon minutes before the Thomas Fire moved through it on Dec. 11, 2017. However, the state has spent more than $34 million on efforts to suppress the Thomas fire, which has knocked out electricity for thousands of residents and driven many more from their homes.